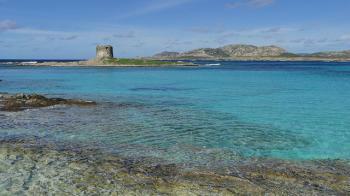 Island of Asinara is part of the Tentative list of Italy in order to qualify for inclusion in the World Heritage List. I visited this tentative WHS in March 2017. I had already seen the island and the outstanding gulf of Asinara from the pristine La Pelosa Beach near Stintino (north-western tip of Sardinia) and that is the most photogenic way of capturing Asinara's beauty. Asinara is a 52 square kilometre uninhabited island and a wildlife and nature reserve as well as a national park. It is home to a population of 'wild' Albino donkeys. Asinara is mainly mountainous with steep rocky coasts and low scrub vegetation. Surrounding the island are very deep seas which are home to a variety of marine species. If you're lucky you might also spot dolphins on your way to the island. However, there are 3 beautiful sandy beaches and the different hues of crystal clear water are something I experienced only in exotic destinations such as French Polynesia, Seychelles or the Caribbean. Human habitation on the island dates back to the Neolithic Age, with Domus de Janas near Campu Perdu. Carved into soft limestone, the constructions are believed to be unique to the island. A lazaretto was built when Asinara became state property in 1885. During the First World War, Asinara was also used as a prison camp and during the Second Italo-Ethiopian War it was used as a place of detention. That is why there are a number of buildings at Cala d'Oliva which have now been turned over to the national park authorities. Asinara's waters offshore were zoned and there are two large no access zones and no fishing zones encompassing 79 km of coastline around the island and 110 square kilometres of its coastal waters. Docking of private boats is strictly forbidden. The only way to visit part of the island is by booking a guided group tour from Stintino or La Pelosa beach or else from Porto Torres on the main island of Sardinia. The following site gives all the possibilities and contact details (http://visiteasinara.com/visite.php). I took the daily excursion with Futurismo Asinara and spent a whole day exploring the island by boat and stopping for lunch, swimming and some hiking at different parts of the island. This excursion is not available in July and August. Already in March it was quite hot even though very windy. All in all, Asinara is a well protected hidden gem and even if it is not inscribed is well worth a visit (if only for the heavenly waters! ).